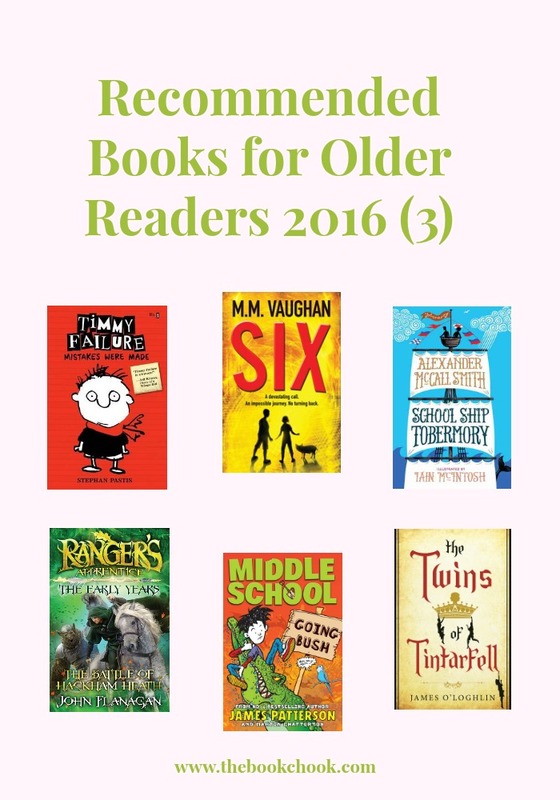 Earlier I brought you Recommended Books for Older Readers 2016, and Recommended Books for Older Readers 2016 (2). Here is the third instalment. All would make great gift ideas for a reader near you! 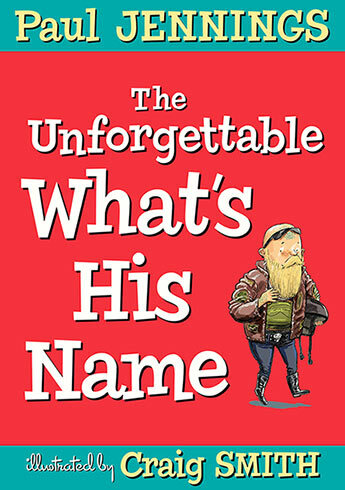 The Unforgettable What’s His Name by Paul Jennings, illustrated by Craig Smith, published by Allen and Unwin (2016.) RRP: $Au14.99. When you’re really really shy, you just don’t want people to notice you. Our young hero is desperately lonely but also desperate not to be seen. Then he sets a chain of events into action that makes for an amazing adventure kids will love. They will also relish the plot twists and turns, and enjoy the humour and awkward moments. Jennings has the ability to write uncomplicated text so it’s easy to read, without dumbing down. Smith’s illustrations are lots of fun, and his skill at showing a boy who blends in with the background is remarkable. I know young readers will have a ball trying to locate What’s His Name in many of the illustrations. Recommended for kids 7+, particularly those who are not yet sold on reading and who want a chapter book where the text is in large font and is broken up with pictures, both black and white and coloured. Take eleven-year-old Timmy Failure - the clueless, comically self-confident CEO of the best detective agency in town, perhaps even the nation. Add his impressively lazy business partner, a very large polar bear named Total. Throw in the Failuremobile - Timmy's mom's Segway - and what you have is Total Failure, Inc., a global enterprise destined to make Timmy so rich his mother won't have to stress out about the bills anymore. Of course, Timmy's plan does not include the four-foot-tall female whose name shall not be uttered. And it doesn't include Rollo Tookus, who is so obsessed with getting into "Stanfurd" that he can t carry out a no-brain spy mission. This one will appeal to kids 8+ who want a book that has them rolling on the floor with laughter. Pastis’s comic timing is excellent and he presents us with a hero whose mistakes make him very endearing. The cartoon-style sketches are frequent and serve to break up the text as well as add another layer of humour. Best of all, for those kids who love a series, Timmy Failure: Mistakes Were Made is only the first book of five so far. There are classroom notes to support the book, and you can get more of an idea of Timmy Failure: Mistakes Were Made by checking out the video below. Six by M.M.Vaughan, published by Alma Books (Bloomsbury) 2016. RRP: $Au 15.99. When Parker Banks moves with his family from London to New York, he struggles to adapt to his new school and environment. His scientist dad is constantly at work on a top-secret technological venture for a major corporation, when one day he is kidnapped. It is up to Parker, along with his deaf sister Emma, their friend Michael and the pet pig their father left behind, to find and rescue him. They have at their disposal the E.F.E. device that their dad has invented to allow the family members to communicate with one another through telepathy. As their search progresses, it becomes clear that Six, the project that Parker's father has been involved in against his will, is a sinister enterprise that poses a threat not only to the Banks family, but to the world at large. This is a 300+ page solid middle-grade chapter book of thrilling science fiction for kids 10+. Lots of real science and gadgets will hook kids with a yen in those directions; others will enjoy following clues and solving the mystery. The highlights of Six, for me, were the strong family bond between Parker, Emma and their parents, the flashes of humour throughout and the way the plot twists kept me guessing. It’s fair to say that Rafe’s recent trip Down Under could not easily be called a success: in Australia he and his Mom were forced to flee a pack of bloodthirsty zombies after the ‘performance piece’ by Rafe and The Outsiders traumatised Shark Bay (aka ‘Australia’s Bravest Town’). Yet, when Rafe receives an offer to attend an all-expenses paid ‘Cultural Campout’ in the Northern Territory, Australia, he takes precisely six seconds to say ‘yes’. What happens next is full-throttle outback adventure in which Rafe will have to draw on every bit of his new-found ‘Man of Experience’ persona to make it out alive. If you know kids who love humour, snappy dialogue, humour, outrageous adventures, humour and characters so believable you feel they live next-door, do introduce them to this series, and Middle School: Going Bush in particular. Aussie kids will alternate between groaning and guffawing over camp life, and relish all the gags, jokes and goofy sketches that bring the book to life. Follow the exploits of the children who go to a most unusual school – the sail-powered training ship Tobermory. When a film crew arrives in Tobermory Bay, Ben and Fee are invited to be extras. But their suspicions are soon aroused – is the film crew genuine, or are they up to something sinister? Ben and Fee soon discover the truth when they uncover a dastardly plan masterminded by a South American businessman. Books about kids who go to boarding school always seem exciting to those of us who’ve never been through such adventures and hardships! Tobermory is even more unusual because it’s a boarding school on a sailing ship - lots of scope for adventure there. I think School Ship Tobermory will appeal to kids who enjoy chapter books set in a richly detailed school-type world, with believable child characters and quirky teacher characters, and a good dash of fun and frolic thrown in. The Twins of Tintarfell by James O’Loghlin, published by Pan Macmillan Australia (2016.) RRP: $Au16.99. The Twins of Tintarfell is just the sort of fast-paced adventure kids love. Add to that a very detailed and magical medieval world, special powers like speech with animals, lots of tension and plot twists, and O’Loghlin seems to me to have honed in accurately on what makes a book a real page-turner. Dani and Bart are main characters we can both relate to, and like - another very important book ingredient. Recommended as a middle-grade chapter book for kids 10+. Ranger’s Apprentice: The Early Years 2 The Battle of Hackham Heath by John Flanagan, published by Penguin Random House Australia. RRP: $Au18.99. When Baron Morgarath escaped to avoid punishment for treason, an uneasy peace fell on Araluen. But the Rangers know Morgarath will be planning his next move. King Duncan must prepare for war. Halt volunteers for a seemingly impossible task – climbing the deadly cliffs of the Mountains of Rain and Night and venturing deep into enemy territory to spy on Morgarath. Meanwhile, Crowley must ensure the Queen’s safety as she undertakes her own perilous journey for the sake of her unborn child. Morgarath’s force of savage, inhuman Wargals seems unstoppable against Duncan’s depleted army. One wrong move could mean defeat. At the Battle of Hackham Heath, the fate of a Kingdom will be decided. Ranger's Apprentice The Early Years 2: The Battle of Hackham Heath is a prequel, an explanation of how Halt came to be Araluen’s most renowned Ranger. It’s a chapter book that takes its place amongst 12 others of the Ranger’s Apprentice main series, and is the second after The Tournament at Gorlan in the Early Years series. So many kids love to read a series - they like to know what they are getting in a new book, feel familiar with the characters and trust the author to deliver an entertaining book. Flanagan definitely has the knack of knowing what kids want to read: the Ranger’s Apprentice books are tightly written, fast-paced adventures, full of action, humour and intrigue. Although this book could certainly stand alone, I think it will be gleefully grabbed by kids 10+ who are already caught up in the Ranger’s Apprentice series. You can also read lots of reviews of recently published books for children in my HUGE list of Books, Apps and Gift Ideas for Kids and Other People, 2016.